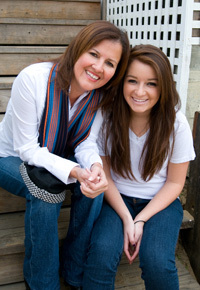 Body image issues are a very real concern for parents of teens, particularly of teen girls. When a teenager gets it into her mind that she is “fat,” it can create a huge set of problems, from eating disorders to thoughts of suicide. What can you, as a parent, do when your child thinks she is “fat”? Denying the problem by saying “No, you’re not,” is a common reaction. After all, you love your daughter and think she is beautiful, no matter what. But this is not helpful. Even if she is not fat, she is going to see this for what it is – an attempt to gloss over her feelings. She may even view it as a rebuttal and will stop sharing her feelings with you. First, determine if this is true. If your child is overweight, it will not help to overlook the problem. While you do not want to contribute to her body image issues, you can help her, in a loving way, to make better decisions about exercise and diet. By helping her understand why she is overweight, without focusing on the “fat” aspect of things, you can help her slim down in a supportive, loving way. Next, determine where the idea came from. Is it from media, friends or even a coach or teacher? If there is a real source, then it may be time to address that source, especially if your daughter is at a healthy weight. Often, however, this statement comes from your child’s own insecurities. She feels insecure, ugly and undesirable. Maybe a boy at school paid attention to her friend instead of her. Perhaps she did not get picked for the school play and feels she must blame something. Whatever the reason, you need to find ways to support her security, rather than denying her feelings. Now, remember that girls are emotional. Even these careful questions may end in a puddle of tears and frustration. That’s ok. It shows her that you are ready to listen when she is ready to talk. After you have had this conversation, take opportunities to show her how beautiful she is. Take her for a manicure, perhaps, or let her choose a new outfit that fits well. Do not address the “fat” issue when you do these activities. Simply support her and help her feel beautiful. Use affirming phrases whenever you can, and be there for her when she needs to have a good cry. That is the best way you can support your daughter when she goes through this somewhat normal time of insecurity.